Nick Bullen’s section from “The Michigan Video II” now online! Here’s one we’ve been waiting to see surface online! Albe’s BMX just uploaded Nick Bullen‘s section from “The Michigan Video II” is packed with good vibes, plenty of big rails and ledges getting slayed, big gaps and more. Nick isn’t scared to send it and he definitely brought the heat for this part. Are you on the hunt for some new BMX grips? Well, after you watch this new promo for Nick Bullen‘s new signature Genetic Grips from Subrosa, you’ll probably want to pick up a pair. Watch as Nick crushes spot after spot during a recent trip to Arizona. Nick is a grinding machine… Maybe we’ll see some Genetic signature pegs in the future! Learn more about the Genetic Grips here! “Subrosa pro rider Nick Bullen ditched the cold weather in Michigan and hit the road to Arizona for week of sunshine, riding and good times. He met up with Bobby Kanode and filmed a quick promo for his new signature Genetics Grips. Check out the edit, then check out his grips at shop near you, you’ve got to feel em to believe em! Subrosa have released a fresh new Bike Check with Nick Bullen and his current Thunderbeast setup that he’s running. 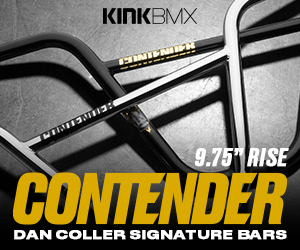 We didn’t spot any prototype parts, but there’s a few new ones that just hit BMX shops and mail-orders on there. You can check out a bunch of photos and a full parts list here — Nick Bullen Bike Check! The new Nick Bullen signature grips from Subrosa have arrived. These grips feature a unique rib pattern with circles, DNA inspired lines, and Zodiac symbols on the flanges for an extra touch. These grips are 170mm long (about 20mm longer than most) with a medium circumference and they’re made from the DCR rubber which keeps them soft, but long lasting. Each pair comes with Nylon bar ends to match. The Genetic grips are available through BMX shops and mail-orders that carry Subrosa in black and Tiffany blue now! Want to learn more about the grips? Check out this Interview with Nick about them!